The first in vitro study assessing the bystander effects following a fractionated irradiation regimen was carried out by Mothersill and Seymour in 2002. The results indicated that the sparing effects of dose fractionation were reduced in directly irradiated cells. Although these results were not supported by Ilnytskyy et al. Widel  claimed that the radiation bystander effect has an important role during fractionated radiotherapy and implies a risk of postradiation complication in healthy tissues. The present study was performed to determine the level of damage induced by bystander effect (RIBE level) in fractionated irradiation (two consecutive fractions) and to compare it with the effects of single-dose irradiation with the equal dosage. QU-DB, a human lung tumor cell line,  and MRC5, a normal human lung fibroblast cell line  were selected as target cells, whereas MRC5s also acted as bystander cells. These two cell lines were chosen to simulate actual radiotherapy conditions. In real radiotherapy, tumor cells are irradiated directly, while nonirradiated/irradiated normal cells are considered as bystanders which would receive signals produced by irradiated tumor cells. Furthermore, from the results of previous studies, , it is evident that these cell lines are able to induce bystander effects and have the potential to be affected by bystander signals produced by irradiated cells. The cells were irradiated by Gamma rays from 60 Co, and the medium transfer technique was applied to induce RIBE. Micronucleus formation was considered as the end point, and in the fractionation regimen, target cells were irradiated twice with a 6-h interval. Cell lines were acquired from the Pasteur Institute in Tehran, Iran. QU-DB cells were grown in RPMI-1640 medium (Biosera, England) supplemented with 10% fetal bovine serum (Biosera, England), 100 units/mL penicillin (Biosera, England), and 100 μg/mL streptomycin (Biosera, England). MRC5 cells were cultured in high glucose DMEM medium (Gibco, Germany) containing 20% fetal bovine serum (Biosera, England) and 2 mM L-glutamine (Biosera, England). The applied concentrations of penicillin and streptomycin were similar to those used for QU-DB cell cultures. The cultures were maintained at 37°C in a humidified atmosphere of 95% air and 5% CO 2. FBS = Fractionated bystander cells that received medium from flasks irradiated with a fractionated dose. Two days prior to irradiation, subconfluent cells were trypsinized and cultured in 10 cm 2 flasks. 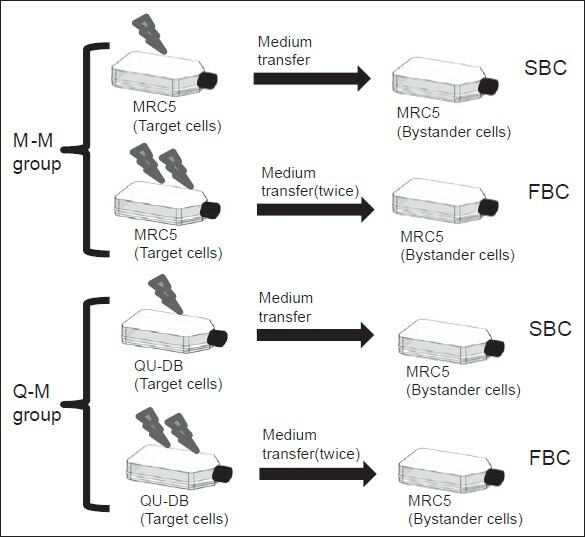 Flasks containing QU-DB cells were prepared as target flasks; whereas, MRC5 cells were cultured in some flasks as target cells, and in others as bystander cells. Irradiation was performed with Gamma rays emitted from a 60 Co teletherapy unit (Theratron, Phoenix model) at room temperature. The mean dose rate was 0.72 Gy/min. The field size was 15 × 15 cm and the source to surface distance was 70 cm. Target flasks were placed on a water phantom (30 × 30 × 10 cm) which is used for dosimetry. The height of the culture media in the flasks was 5 mm; hence, the cells attached to the bottom of the flasks were at the depth of maximum emission dosage of 60 Co Gamma rays. Following irradiation, the flasks were returned to the incubator. In cases of fractionated irradiation, the time interval between the two subsequent irradiations was 6 h. It ensured that adequate time was given to the cells to repair their radiation-induced injuries. The medium transfer technique was used to induce a bystander effect in nonirradiated cells. One hour following irradiation, media of the target flasks was collected and filtered through 0.22 μm acetate cellulose filters (Orange Scientific, Belgium), and then transferred to specified bystander flasks. Filtering was carried out to ensure that the target cells were not transferred to the bystander flasks. For fractionated subgroups, medium transfer was performed after each fraction. The cytokinesis block technique was applied to determine the number of cells containing micronucleus (MNBN cells. , After the last medium transfer, the bystander flasks were exposed to 2 μg/mL cytochalasin B, and were placed in an incubator for 45 h. The culture medium was then removed; cells in the flasks were washed with phosphate-buffered saline, and fixed in situ in 100% methanol. Finally, they were stained with 10% Giemsa for 7 min and were viewed at × 400 magnification. At least, 1000 binucleated cells were scored on each slide and the number of MNBN cells was determined. All the data acquired in this study had a normal distribution; therefore, statistical analysis was performed using one-way analysis of variance and Tukey's multiple comparison tests at P < 0.05. All the data presented in the following section are based on the mean of at least six independent measurements. [Table 1] shows the frequency of MNBN cells in the MRC5 bystander group, which received the medium from autologous-irradiated cells. The frequency of MNBN cells in all subgroups was statistically different when compared with the control group (P < 0.001). However, no significant difference was observed between the subgroups (P > 0.05). In other words, the RIBE level in the single dose regimen was independent of dose and was equal to the corresponding values of the fractionation regimen. 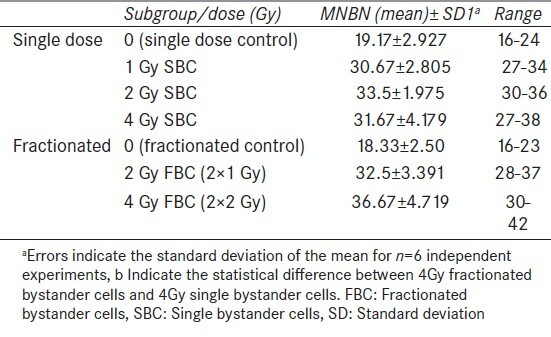 For example, both a 4 Gy single acute (4 Gy SBC), and fractionated (4 Gy FBC) dose induced the same number of MNBN cells (P = 0.334). The same effect occurred for 2 Gy, as the frequency of MNBN cells for 2 Gy SBC and 2 Gy FBC (2 × 1 Gy) was not significantly different (P = 1.000). 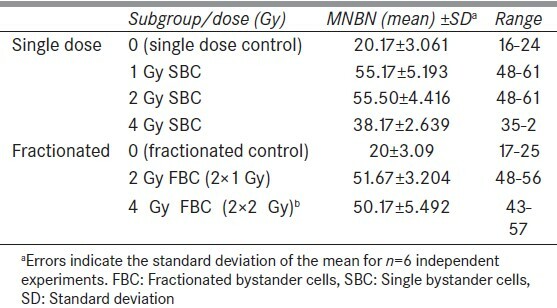 In order to determine the possible recurrence of RIBE following a second irradiation, 1 Gy SBC was compared with 2 Gy FBC (2 × 1 Gy), and 2 Gy SBC was compared with 4 Gy FBC (2 × 2 Gy). In both cases, there was no significant difference between the compared subgroups (P > 0.05). [Table 2] represents the number of MNBN cells in the MRC5 bystander group which received medium from QU-DB-irradiated cells. In all subgroups, the number of MNBN cells was significantly higher than the control group (P < 0.001). Tukey's multiple tests indicated no significant difference between 1 Gy SBC and 2Gy SBC (P = 1.000). However, these subgroups were statistically different from 4 Gy SBC (P < 0.001), as experienced in a previous study. The difference between 2 Gy SBC, and 2 Gy FBC (2 × 1 Gy) was also nonsignificant (P = 0.604). Thus, single and fractionated radiation in this dose had the same bystander effects. However, a significant difference was observed between 4 Gy SBC, and 4 Gy FBC (2 × 2 Gy) subgroups (P < 0.001). Yet, when 2 Gy SBC was compared with 4 Gy FBC (2 × 2 Gy), the difference was not statistically significant (P = 0.256). Similar results were also obtained for 1 Gy SBC and 2 Gy FBC (2 × 1 Gy) (P = 0.373). [Figure 2] represents the dose-response relationship of the two groups, when they were affected by the single acute dose regimen. In a previous study, it was found that the RIBE level in MRC5 cells was independent of dose, that is, 0.5, 2, and 4 Gy were able to induce the same effects on bystander cells. Therefore, it was concluded that if fractionated irradiation results in the occurrence of RIBE following each fraction, it may also enhance the RIBE level when compared with an equal single dose irradiation. In other words, it is expected to observe a higher RIBE level in 4 Gy FBC (2 × 2 Gy) than in 4 Gy SBC. 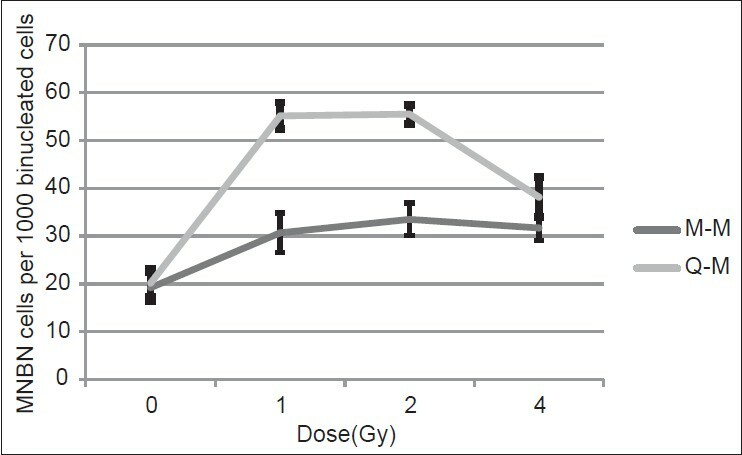 To verify the correctness of this assumption, target cells were irradiated by a fractionated or single dose regimen and the RIBE level was compared in their corresponding bystander cells, that is, the 2 Gy single dose was compared with two fractions of 1 Gy, as well as the 4 Gy single dose being compared with two fractions of 2 Gy. Before comparing the fractionated and single dose regimens, 1 Gy SBC was compared with 2 Gy FBC (2 × 1 Gy) as well as 2 Gy SBC with 4Gy FBC (2 × 2 Gy). The purpose of this comparison was to determine whether bystander damages were regenerated as a result of the second fraction. The results revealed the MNBN cell frequencies of 1 Gy SBC, and 2 Gy FBC (2 × 1 Gy) to be equal (P > 0.05). It meant that no additional damage was generated after the second fraction. Similar results were obtained when 2 Gy SBC, and 4 Gy FBC (2 × 2 Gy) were compared. To explain this observation, it should be kept in mind that the bystander response of MRC5 cells in a single dose regimen was independent of dose. This indicates that the RIBE level is constant, or reaches a saturated level [Figure 1] and therefore could not be increased as a result of the second radiation dose. When single doses were compared with equal fractionated doses, no significant difference was observed between 2 Gy SBC, and 2 Gy FBC (2 × 1 Gy), in both the M-M and Q-M groups. This was accordingly true for 4 Gy SBC, and 4 Gy FBC (2 × 2 Gy) in the M-M group. This finding indicates that single and fractionated dose irradiation have similar effects on bystander cells. However, there was an exception; in the Q-M group the RIBE level increased when a dose of 4 Gy was divided into two equal fractions [Table 2]. To clarify this finding, it is necessary to remember that the RIBE level in 4 Gy SBC was lower than the saturated/constant level. This finding was previously attributed to a probable negative feedback induced in bystander cells as a result of a large quantity of bystander signals produced by target cells. Conversely, Blyth and Sykes  have suggested that the reduction of bystander signals produced by the target cells, due to their death in high dose would cause a reduction in the RIBE level. It is not clear which of these two theories is correct; however, if the negative feedback theory is accepted, it is reasonable to conclude that the fractionated dose has reduced the bystander signals, eliminated the negative feedback, and increased the RIBE level. Based on the results which showed bystander damages not to have regenerated after the second fraction, it could be concluded that the RIBE damages induced by 4 Gy in Q-M FBC (2 × 2 Gy) were only due to the first fraction. Mothersill and Seymour  studied the effects of dose fractionation on RIBE in a keratinocyte cell line. Unlike the results of this study, they found that the fractionated dose was more toxic than a single dose. Results of the present study are also in contrast to Widels'  findings in low dose. Widel observed that the bystander damage induced by three fractions (3 × 0.5 Gy) is more than one fraction meaning that the damages caused by the second and third fractions are added to those of the first fraction. However, at higher doses, the quantity of damages induced by one (2 Gy) or three fractions (3 × 2 Gy) was the same. The latter observation is in agreement with the results of the present study. The accumulation of direct and bystander effects has also been discussed and investigated by Zhang et al. The authors described that the short-time incubation of cells with conditioned medium extracted from target cells acts as a priming dose, which induces radiation adaption against subsequent direct irradiation. However, increasing the incubation time could reverse the effect and cause RIBE adverse effects to be added to the direct ones. Different results obtained from different studies may be attributed to the different experimental conditions, and different cell types which have been studied. It is predicted that the dose-response relationship is an effective factor which determines the efficacy of dose fractionation. As in the present study, the inefficacy of dose fractionation was attributed to the constant response of MRC5 cells. Therefore, further studies mainly focusing on cell lines with a dose-dependent response to bystander signals are required in this respect. The number of MNBN cells in the Q-M group was significantly higher than the corresponding values of the M-M group (P < 0.01). This observation indicates that in 1 and 2 Gy, QU-DB target cells were more capable than MRC5 target cells to induce micronucleus in bystander cells. In the previous study,  such difference in RIBE was not observed in MRC5 cells exposed to single dose radiation. Besides, MNBN cells frequency in both groups was lower than the values obtained in the present study. This may be attributed to different time intervals between irradiation and the medium transfer. In the present study, the time interval was 1 h, whereas in the mentioned one  it was 24 h.
In summary, RIBE did not increase as a result of fractionated irradiation as the MNBN cell frequencies were almost similar for both single acute and fractionated doses. It is a desirable observation, as it indicates that the fractionated regimen applied in radiotherapy may not increase the RIBE level in normal lung fibroblast cells. However, it has yet to be further approved by in vivo experiments. Furthermore, as the phenomenological picture of RIBE depends on the culture media and experimental design, it is recommended to investigate other end points and fractionated regimens (with three or more fractions) in future research. The authors would like to thank the office of the Vice-President for Research affairs of Mashhad University of Medical Sciences (MUMS) for funding this work. The authors are also grateful to Omid hospital for allowing use of the Co-60 tele-therapy unit. This article is based on the results extracted from an MSc thesis (code no: A-374) presented to the medical physics dept. of MUMS. 1. Gow MD, Seymour CB, Byun SH, Mothersill CE. Effect of dose rate on the radiation-induced bystander response. Phys Med Biol 2008;53:119-32. 2. Shao C, Folkard M, Michael BD, Prise KM. Bystander signaling between glioma cells and fibroblasts targeted with counted particles. Int J Cancer 2005;116:45-51. 3. Shao C, Aoki M, Furusawa Y. Bystander effect on cell growth stimulation in neoplastic HSGc cells induced by heavy-ion irradiation. Radiat Environ Biophys 2003;42:183-7. 4. Hamada N, Matsumoto H, Hara T, Kobayashi Y. Intercellular and intracellular signaling pathways mediating ionizing radiation-induced bystander effects. J Radiat Res 2007;48:87-95. 5. Prise KM, O'Sullivan JM. Radiation-induced bystander signalling in cancer therapy. Nat Rev Cancer 2009;9:351-60. 6. Rzeszowska-Wolny J, Przybyszewski WM, Widel M. Ionizing radiation-induced bystander effects, potential targets for modulation of radiotherapy. Eur J Pharmacol 2009;625:156-64. 7. Butterworth KT, McGarry CK, Trainor C, O'Sullivan JM, Hounsell AR, Prise KM. Out-of-field cell survival following exposure to intensity-modulated radiation fields. Int J Radiat Oncol Biol Phys 2011;79:1516-22. 8. Widel M. Intercellular communication in response to radiation induced stress: Bystander effects in vitro and in vivo and their possible clinical implications. In: Singh N, editor. Radioisotopes: Applications in Physical Sciences. Ch. 17. Poland: Intech; 2011. p. 335-366. 9. Toossi MT, Soleymanifard S, Mahmoudi M, Sazgarnia A. Demonstration of radiation-induced bystander effect in a human lung cancer cell line. Int J Low Radiat 2010;7:298-305. 10. Soleymanifard S, Bahreyni MT. Comparing the level of bystander effect in a couple of tumor and normal cell lines. J Med Phys 2012;37:102-6. 11. Burdak-Rothkamm S, Prise KM. New molecular targets in radiotherapy: DNA damage signaling and repair in targeted and non-targeted cells. Eur J Pharmacol 2009;625:151-5. 12. Azzam EI, Little JB. The radiation-induced bystander effect: Evidence and significance. Hum Exp Toxicol 2004;23:61-5. 13. Boyd M, Ross SC, Dorrens J, Fullerton NE, Tan KW, Zalutsky MR, et al. Radiation-induced biological bystander effect elicited in vitro by targeted radiopharmaceuticals labeled with α-, ß-, and Auger electron-emitting radionuclides. J Nucl Med 2006;47:1007-15. 14. Mothersill CE, Moriarty MJ, Seymour CB. Radiotherapy and the potential exploitation of bystander effects. Int J Radiat Oncol Biol Phys 2004;58:575-9. 15. Ilnytskyy Y, Koturbash I, Kovalchuk O. Radiation-induce bystander effects in vivo are epigenetically regulated in a tissue-specific manner. Environ Mol Mutagen 2009;50:105-13. 16. Mothersill C, Seymour CB. Bystander and delayed effects after fractionated radiation exposure. Radiat Res 2002;158:626-33. 17. Cole SP, Campling BG, Dexter DF, Holden JJ, Roder JC. Establishment of a human large cell lung tumor line (QU-DB) with metastatic properties in athymic mice. Cancer 1986;58:917-23. 18. Jacobs JP, Jones CM, Baille JP. Characteristics of a human diploid cell designated MRC-5. Nature 1970;227:168-70. 19. Soleymanifard S, Bahreyni Toossi MT, Sazgarnia A, Mohebbi S. The role of target and bystander cells in dose-response relationship of radiation-induced bystander effects in two cell lines. Iran J Basic Med Sci 2013;16:177-83. 20. Fenech M. The cytokinesis-block micronucleus technique: A detailed description Of the method and its application to genotoxicity studies in human populations. Mutat Res 1993;285:35-44. 21. Albertini RJ, Anderson D, Douglas GR, Hagmar L, Hemminki K, Merlo F, et al. IPCS guidelines for the monitoring of genotoxic effects of carcinogens in humans. International Programme on Chemical Safety. Mutat Res 2000;463:111-72. 22. Blyth BJ, Sykes PJ. Radiation-induced bystander effects: What are they, and how relevant are they to human radiation exposure? Radiat Res 2011;176:139-57. 23. Zhang Y, Zhou J, Baldwin J, Held KD, Prise KM, Redmond RW, et al. Ionizing radiation-induced bystander mutagenesis and adaptation: Quantitative and temporal aspects. Mutat Res 2009;671:20-5.